Dermalogica Precleanse* | So I thought I'd start off with cleansers as that's usually what 'sets the tone' for how your skin looks and feels. 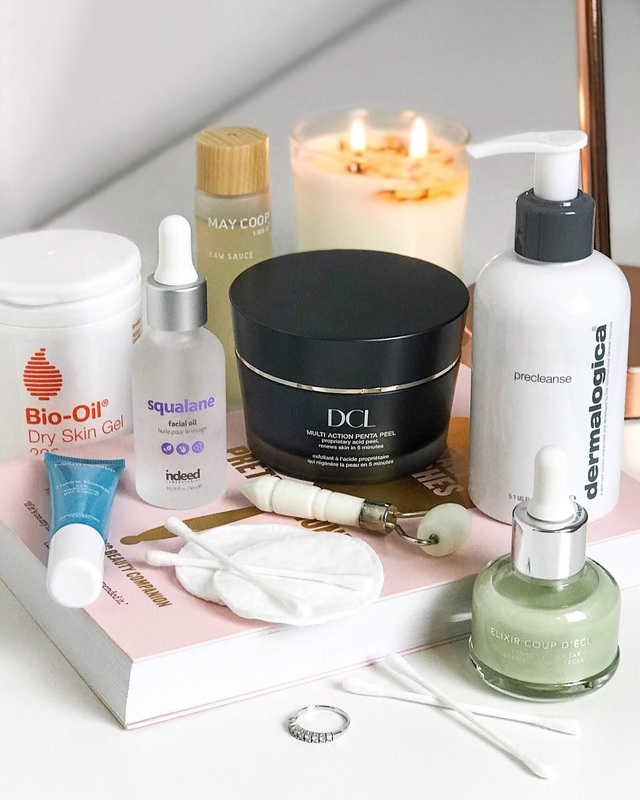 I love using a light gel or milk in the warmer months but as it gets colder and you're constantly switching between the freezing cold and central heating you're going to need something beefier. That's a nice word, isn't it? This cleansing oil is the perfect option as it destroys all of your makeup and SPF but it's also extremely softening and hydrating. I find it really calming and my skin feels so much healthier when I use this. It also emulsifies so it doesn't leave a greasy residue. Win! DCL Multi Action Penta Peel Pads* | I cannot stress enough how important it is to have a chemical exfoliant in your routine at this time of year. They're exactly what you need to get your skin looking fresh and radiant and not like you've gone through 15 boxes of mince pies. I love a good acid pad and these are without a doubt the best ones I've tried. You get 50 in a pot and they're loaded with naturally derived acids including Salicylic, Lactic and Mandelic (my fave). They do so much for the skin but to sum up they exfoliate and remove dead skin, stimulate collagen production and reduce the appearance of fine lines and wrinkles. I use them 2-3 times a week and my skin has never been smoother! May Coop Raw Sauce* | I've never really been a big essence user but I definitely see the benefits of having one in my routine. If dehydration is an issue for you (which it is for the majority of us) then this is a really great step to have! Rich in anti-oxidants this leaves your skin super hydrated and plump and also protected against free radicals. I also love that it comes in a travel size! Neutrogena Hydro Boost Eye Awakening Gel-Cream | My under eyes are so dark recently but I've realised there's not a great deal I can do as they're mostly genetic (thanks mom) so I'm focusing mainly on the dehydration lines and dryness. I don't like a super rich cream as I get extremely puffy in the mornings but this light-weight gel has been amazing for keeping my eyes moisturised and smooth. A fab highstreet find! The Ordinary Advanced Retinoid 2% | I always step up my retinol game when I've neglected my skin and I still love this one as it's really light, absorbs easily and doesn't give me any irritation. I've had a lot of congestion recently but as soon as I start using this consistently it virtually disappears and my skin looks really even and poreless. I also find it great for reducing any pigmentation, fine lines and dull areas! It's super affordable too! Indeed Laboratories Squalane Facial Oil | I've skipped moisturiser and gone straight to grease as nothing gets my skin looking plump and juicy like a good quality oil. This beauty is derived 100% from Sugarcane and is great if you need some extra hydration without the gloopy texture. It's quite a thin formula but you only need 1-2 drops as it's very nourishing and won't clog your pores! Fun tip, apply this onto clean skin and then add a bit of Charlotte Tilbury's Hollywood Flawless Filter over top for the most beautiful smooth, glowy, filter-esque skin! Becca Skin Love Glow Elixir | It's no secret that I love a glowing base and always use a radiant primer to get as much sheen as possible. This had been on my wishlist for such a long time and I finally picked it up when it went on sale a couple months ago (you gotta love the Instagram beauty community!) This is a gorgeous silky elixir that adds a subtle glow and some extra moisture for your foundation. It also protects against free radicals and environmental stressors! Yes, please! Bio-Oil Dry Skin Gel* | My body gets extremely dry in the Winter but to be honest I'm probably the laziest person when it comes to actually doing something about it. Although it's not all my fault as a lot of body products irritate my skin and leave me greasy and itchy - not a good feeling! I'm a big fan of the original Bio Oil but their new gel formula has completely knocked that off the top spot! It still has an oil base but isn't as slippery and absorbs much quicker. I've been loving it for all over my body but especially my eczema and scar on my forearm. I can't recommend this enough! What are some of your top winter skincare picks?